As in skeletal muscle, cardiac myocytes contract according to the sliding filament theory of muscle contraction. 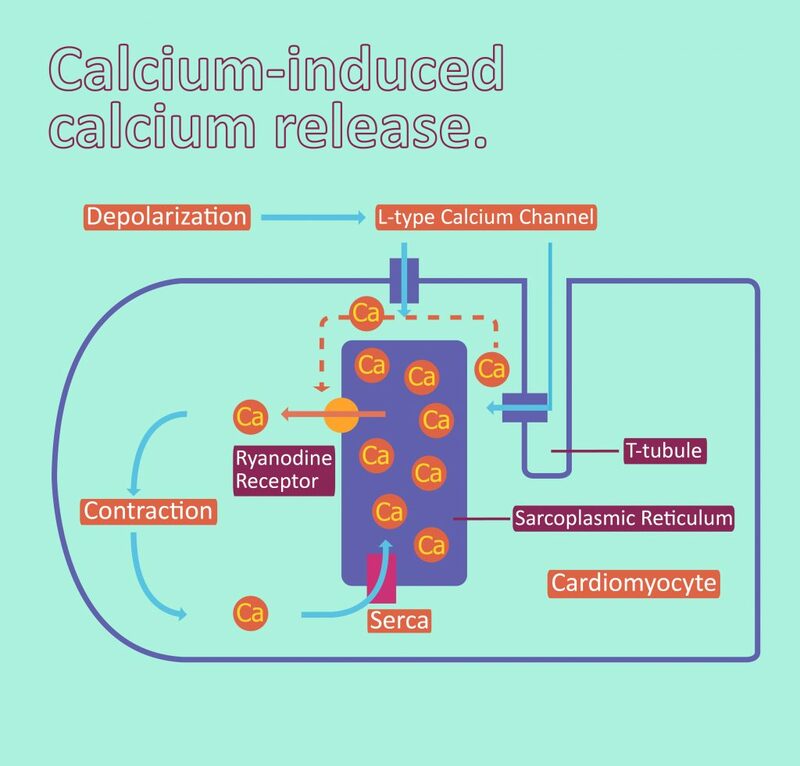 In this article, we will look at the process of calcium-induced calcium release and the electrical coupling of cardiac myocytes. Gq-protein coupling facilitates the release of Ca2+ from the sarcoplasmic reticulum. This is particularly important in muscle types that require calcium induced calcium release (e.g. in cardiac muscle). Ca2+ channels on the SR opens and Ca2+ is released. This calcium binds to RyR and this changes the conformation of a Ca2+ channel that is closely associated with this RyR. Ca2+ stored in the SR is released. This is the ‘calcium spark’. Released calcium leads to a calcium spike which facilitates the binding to troponin C and thus activating the cross bridge cycling mechanism for contraction. After the stimulus is removed, sarco(endo)plasmic reticulum calcium ATPase (SERCA) pumps Ca2+ is moved into the lumen at the expense of ATP. This allows relaxation. Fig 1 – Diagram showing the process of Calcium Induced Calcium Release (CICR). Pacemaker cells in the SA and AV nodes initiate an action potential which is conducted around the heart via gap junctions. The action potential travels down the T-tubules between sarcomeres resulting in an influx of calcium ions into the sarcoplasm through VOCCs. When calcium enters the sarcoplasm (through VOCCs and ryanodine receptors) it binds to cardiac troponin-C which moves the tropomyosin away from the actin binding site thus exposing it and initiating contraction. Cardiac muscle contraction occurs via the sliding filament model of contraction, much like skeletal muscle. Once calcium is bound to troponin-C and the conformational change of tropomyosin has occured myosin heads can bind to actin. 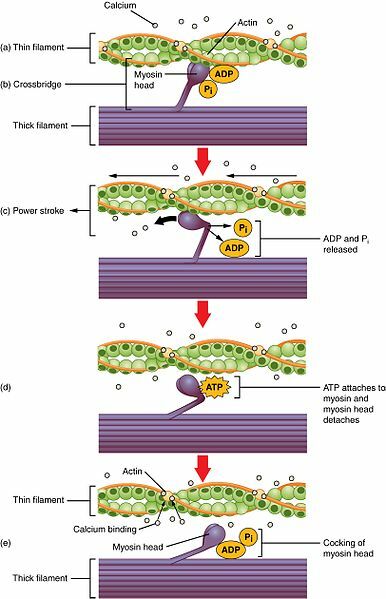 Following this ADP and inorganic phosphate are released from the myosin head so the power stroke can occur, in this the myosin pivots and bends, pulling on the actin and moving it, causing muscle contraction. After this occurs a new molecule of ATP binds to the myosin head, causing it to detach from the actin. Finally, the ATP is hydrolysed into ADP and inorganic phosphate, following this the cycle can begin again and further contraction can occur. Fig 2 – Diagram showing the sliding filament model of muscle contraction. By entering the sarcoplasmic reticulum for storage via a SERCA (sarco(endo)plasmic reticulum calcium-ATPase) channel at the expense of an ATP molecule. Through an NCX (sodium-calcuim exchange) channel which extrudes a calcium ion and admits a sodium ion when membrane repolarisation starts. Calcium is no longer is bound to troponin C and the actin binding site is covered up ending contraction and relaxing the muscle. Some subtypes of troponin can be used as very specific and sensitive markers of damage to the cardiac muscle, particularly troponin I and T. They are typically measured in the blood to differentiate between unstable angina and myocardial infarctions, as they may present with similar symptoms. A patient suffering from a myocardial infarction would typically show elevated cardiac troponins within the blood, which would not be the case for unstable angina. Depending on the troponin measured the levels would peak a few hours following the damage and they can remain high for up to two weeks after the event. However it is important to note that they are not specific to myocardial infarction and only indicate cardiac muscle damage, as such they may also be elevated in conditions such as heart failure, pericarditis and amyloidosis. In addition to this, non-cardiac diseases such as sepsis or renal failure can also elevate troponins. Fig 3 – Graph showing the levels of cardiac markers in the hours following onset of chest pain. Troponin T is displayed in grey. Which membrane protein directly responds to the depolarisation of cardiomyocytes? Which membrane protein located on the sarcoplasmic reticulum (SR) is involved in calcium induced calcium release (CICR)? Which membrane protein is responsible for the greatest calcium entry during calcium induced calcium release (CICR)? How do L-type voltage gated calcium channels (VGCCs) cause the opening of ryanodine receptor (RYR) channels in cardiac myocytes? Which pump is mainly responsible for restoring calcium levels after calcium induced calcium release (CICR)?